Definition at line 96 of file LoopPass.h. Definition at line 69 of file LoopPass.cpp. Definition at line 76 of file LoopPass.cpp. References E, llvm::LoopBase< BlockT, LoopT >::getParentLoop(), and I.
Referenced by CloneLoop(), llvm::IRCEPass::run(), and llvm::SimpleLoopUnswitchPass::run(). SimpleAnalysis - Provides simple interface to update analysis info maintained by various passes. cloneBasicBlockSimpleAnalysis - Invoke cloneBasicBlockAnalysis hook for all loop passes. Note, if required this interface can be extracted into a separate abstract class but it would require additional use of multiple inheritance in Pass class hierarchy, something we are trying to avoid. cloneBasicBlockSimpleAnalysis - Invoke cloneBasicBlockAnalysis hook for all passes that implement simple analysis interface. Definition at line 96 of file LoopPass.cpp. References llvm::LoopPass::cloneBasicBlockAnalysis(), getContainedPass(), and llvm::PMDataManager::getNumContainedPasses(). Invoke deleteAnalysisLoop hook for all passes that implement simple analysis interface. Invoke deleteAnalysisLoop hook for all passes. Definition at line 118 of file LoopPass.cpp. References llvm::LoopPass::deleteAnalysisLoop(), getContainedPass(), and llvm::PMDataManager::getNumContainedPasses(). Referenced by llvm::SimpleLoopUnswitchPass::run(), and runOnFunction(). deleteSimpleAnalysisValue - Invoke deleteAnalysisValue hook for all passes that implement simple analysis interface. deleteSimpleAnalysisValue - Invoke deleteAnalysisValue hook for all passes. Definition at line 105 of file LoopPass.cpp. References llvm::LoopPass::deleteAnalysisValue(), getContainedPass(), llvm::PMDataManager::getNumContainedPasses(), and I.
Referenced by CloneLoop(), and ReplaceUsesOfWith(). Definition at line 311 of file LoopPass.cpp. 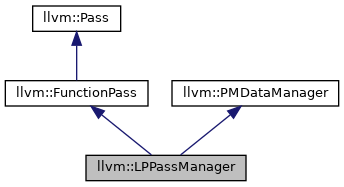 References llvm::PMDataManager::dumpLastUses(), llvm::Pass::dumpPassStructure(), llvm::errs(), getContainedPass(), llvm::PMDataManager::getNumContainedPasses(), llvm::raw_ostream::indent(), and P.
Definition at line 134 of file LoopPass.cpp. Definition at line 112 of file LoopPass.h. Definition at line 111 of file LoopPass.h. Definition at line 117 of file LoopPass.h. Referenced by cloneBasicBlockSimpleAnalysis(), deleteSimpleAnalysisLoop(), deleteSimpleAnalysisValue(), dumpPassStructure(), and runOnFunction(). Definition at line 123 of file LoopPass.h. Definition at line 109 of file LoopPass.h. Definition at line 142 of file LoopPass.cpp. References assert(), llvm::LoopBase< BlockT, LoopT >::contains(), and llvm::sys::fs::remove(). Referenced by llvm::createLoopDeletionPass(), INITIALIZE_PASS(), llvm::LoopSimplifyCFGPass::run(), llvm::SimpleLoopUnswitchPass::run(), tryToUnrollAndJamLoop(), and tryToUnrollLoop(). Definition at line 160 of file LoopPass.cpp. References llvm::PMTopLevelManager::activeStack, addLoopIntoQueue(), assert(), deleteSimpleAnalysisLoop(), llvm::LoopPass::doFinalization(), llvm::LoopPass::doInitialization(), llvm::PMDataManager::dumpPassInfo(), llvm::PMDataManager::dumpPreservedSet(), llvm::PMDataManager::dumpRequiredSet(), llvm::PMDataManager::emitInstrCountChangedRemark(), llvm::EXECUTION_MSG, llvm::PMDataManager::freePass(), getContainedPass(), llvm::Function::getContext(), llvm::LoopBase< BlockT, LoopT >::getHeader(), llvm::Function::getInstructionCount(), llvm::Value::getName(), llvm::Loop::getName(), llvm::PMDataManager::getNumContainedPasses(), llvm::GlobalValue::getParent(), llvm::getPassTimer(), llvm::LCSSAVerificationPass::ID, llvm::PMDataManager::initializeAnalysisImpl(), llvm::PMDataManager::initSizeRemarkInfo(), InstrCount, llvm::Loop::isRecursivelyLCSSAForm(), llvm::MODIFICATION_MSG, llvm::Pass::mustPreserveAnalysisID(), llvm::ON_LOOP_MSG, P, llvm::PMDataManager::populateInheritedAnalysis(), llvm::PMDataManager::recordAvailableAnalysis(), llvm::PMDataManager::removeDeadPasses(), llvm::PMDataManager::removeNotPreservedAnalysis(), llvm::reverse(), llvm::LoopPass::runOnLoop(), llvm::Module::shouldEmitInstrCountChangedRemark(), llvm::PMDataManager::TPM, llvm::LoopBase< BlockT, LoopT >::verifyLoop(), llvm::PMDataManager::verifyPreservedAnalysis(), X, and llvm::LLVMContext::yield(). Definition at line 98 of file LoopPass.h.